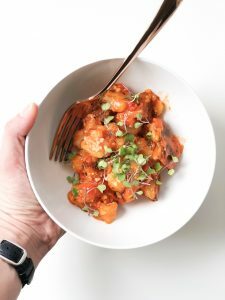 If you haven’t tried Trader Joe’s Cauliflower Gnocchi yet, it is time that you do. Trust me on this. They are $2.69 per package and just enough for my husband and I for a meal. Did I mention that they are delicious?? 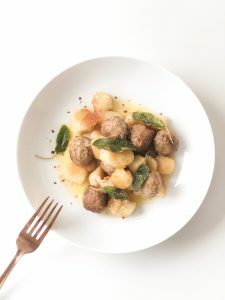 A piece of advice: I would pick up a couple of packages of Cauliflower Gnocchi when you are there because the stores tend to run out of them often. Thanks Trader Joe’s for yet another awesome meal. Cook them as per the stove-top directions on the packaging. But you have to be patient with these guys. If you rush it and remove them too quickly, they will be mushy and not very appetizing. This is how I cook them: First, I put them in a non stick pan with 1/4 cup of water on medium heat. Then, I cover them and forget them for about 10 minutes. I know the package suggests about 7 minutes of cook time, but that’s not enough in my opinion. You want them to have a little bit of a brown crust on them. Finally, add a drizzle or two of olive oil and cook another 4-5 minutes. Now they’re done! 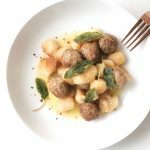 The Costco Meatballs are a freezer staple in our house. 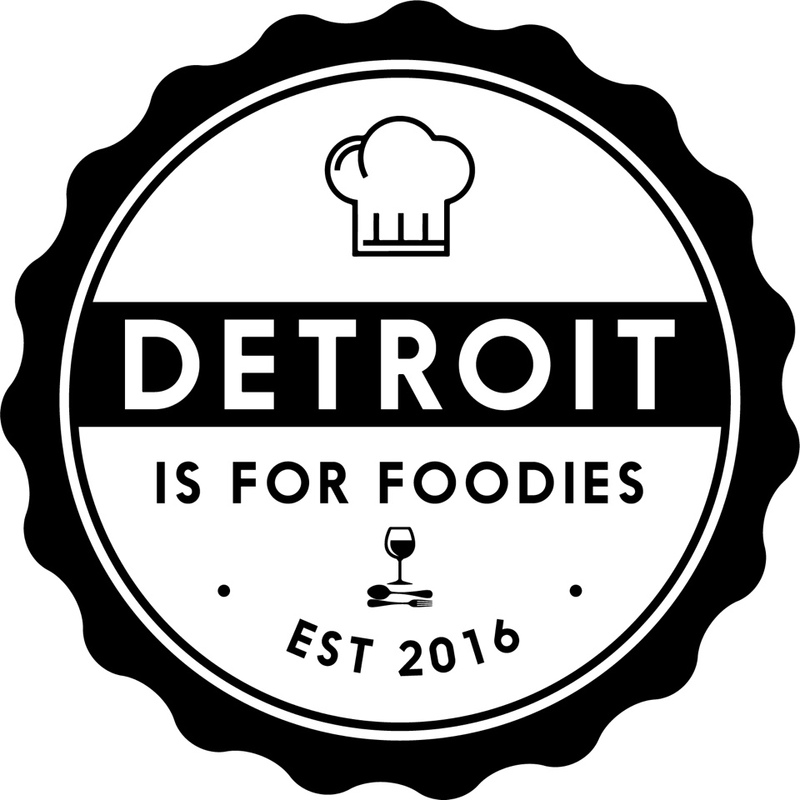 I use them for appetizers and quick weeknight dinners. They are delicious and easy to warm up on the stove top or the microwave. Just follow the package instructions. They are a life saver at times. Busy mom approved!! 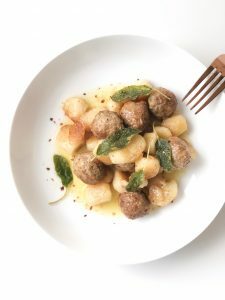 So get out to Trader Joe’s and pick up a few packages of Cauliflower Gnocchi. Serve them with Marinara sauce or this sage butter deliciousness i’m posting about. Here’s another Trader Joe’s favorite of ours, that is just as quick and easy for a weeknight meal: Butternut Squash Triangoli. A quick and delicious meal on a budget. 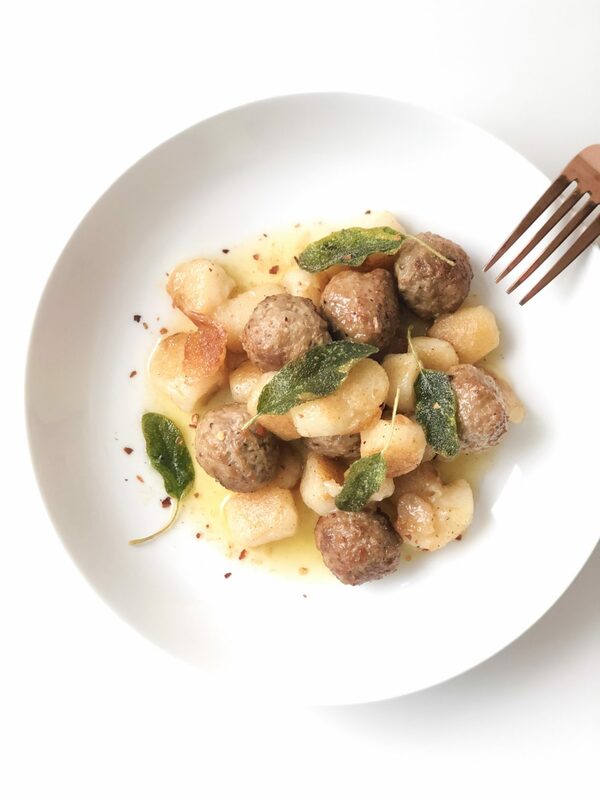 Make this Cauliflower Gnocchi a weekly staple. Cook the Gnocchi as per the package instructions (Read tips above). Cook Meatballs as per package instructions. In a small non stick pan, on medium/low heat, melt the butter. Rinse the sage leaves and dry them. Add them to the melted butter and “fry” them until crispy. Turn them over once. Cook about 3 minutes per side. Next, add the minced garlic, red pepper flakes (depending on your desired spice level), and cook for 2 minutes, just until fragrant. Season with a good pinch of salt and a sprinkle of pepper. Remove the pan from the heat. Add the Meatballs to the pan with the Gnocchi and pour the butter mixture on top. Mix well and cover. Allow to sit for a few minutes before serving so that the flavors combine. Enjoy with a nice slice of crusty bread! Thank you so much! It’s a delicious combo!